Home » Blog » Uncategorized » Give Yourself (or a Loved One) the Gift of Health! Author: Dr. Stephen Wangen is the award winning author of two books on solving digestive disorders, and a nationally recognized speaker on IBS. He has been on ABC, NBC, and Fox as well as public radio. He was recently named one of Seattle’s Top Doctors by Seattle Magazine. Irritable Bowel Syndrome is unfortunately one of the most common health problems in the world. In the USA is it the second most common reason people miss work (Cash et. al., 2005) right behind the common cold. Studies estimate that between 10 and 20 percent of all Americans have IBS. That is a lot of sick people. But ’tis the season of hope. So what better time to give the gift of health? The IBS Treatment Center provides expertise, and a suite of services that is simply not available elsewhere. Most doctors follow the standard of care for IBS and assume that the best their patients can do is manage their symptoms. The IBS Treatment Center goes well beyond the standard and has cured thousands of patients from all over the world of their IBS and the symptoms of diarrhea, constipation, abdominal pain, excessive gas, and bloating. This holiday season, give the gift of health. If you have IBS, call the IBS Treatment Center today at 1-888-546-6283 to get started. If you have a loved one who is suffering, give them the best gift you can – better health so they can live life free of the pain, embarrassment, and inconvenience of IBS. 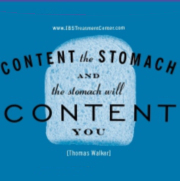 Send them to The IBS Treatment Center website or even pay their first consultation fee. Life is too short to stay sick.